"Liberty & Blood – Mainstream Trap & Modern Hiphop” is a celebration of the freedom that hip-hop & trap embody. This is a pack so grand that it provides a new perspective on what sample packs can be. In this pack you will find premium vocals recorded by Lil Extendo & Flexin3d and drag-and-drop ready exclusive beats for any beat-maker or rapper who wants to lay his hand on producing red-hot chart-topping tracks. If you enjoy artists such as Juice Wrld, Rich the Kid, Lil Yachty, Travis Scott, Drake, ASAP Rocky and Post Malone, this pack was made just for you! This ground-breaking collection features s#*t-hot beats, catchy melodies, tons of usable percussions and anything a beat-maker needs to create a hit of the highest calibre. Focusing mainly on US style and mainstream trap, the beats in this pack are every bit as good as the hits on US radio. Expect a variety of fire drums with some sauce, bell melodies that will give you goosebumps, automatic-rifle style hi-hats, snappy snares, distant atmospheres and a gallery of the most innovative plucks, leads and pads. 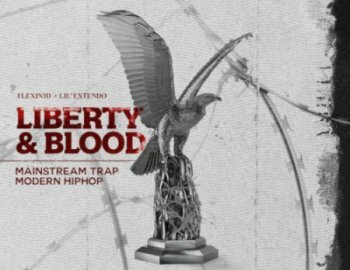 "Liberty & Blood – Mainstream Trap & Modern Hiphop” has it all! If you’re looking for an easy to use pack that is also a crucial library for any beat-making professional, then "Liberty & Blood – Mainstream Trap & Modern Hiphop” is the way.